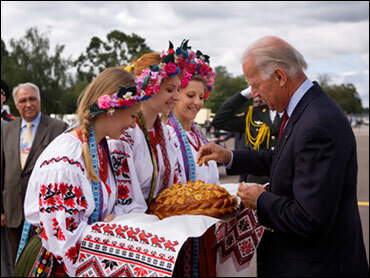 KIEV, July 20 – US Vice-President Joe Biden arrived in Ukraine on Monday to reassure its leaders Washington has not forgotten the ex-Soviet republic following President Barack Obama’s push to improve ties with neighboring Russia. "This is the balancing trip by Biden to Obama’s Moscow visit but the balance is very different to that under the Bush administration," said Christopher Granville of Trusted Sources, an emerging market research firm in London. "It is the vice-president making the balancing trip and not the president, after all." Biden is expected to signal support for Ukraine but the Obama administration is less strident than Bush in backing Yushchenko’s NATO bid. A snap poll by the English-language Kyiv Post found that 66 percent of respondents wanted Biden to tell Ukraine’s leaders: "Get your act together" while only 5 percent suggested "Resist Russia with all your might." The author uses a newspaper website poll (as opposed to a more credible Angus Reid poll) to downplay the Russian threat. President Viktor Yushchenko, vaulted to power in the 2004 Orange Revolution, has angered Moscow with an aggressive bid for Ukraine to join NATO and his promotion of Ukrainian nationalism. There’s been a recent trend by Russian media to erase the Orange Revolution – labeling it ‘so-called’ as to downplay its importance and inferring Yushchenko was somehow placed into leadership by a coup as opposed to the reality that was a re-vote from a rigged election. And nationalism is just media slang for xenophobia. Anyways, we’ll see what Biden does in Ukraine and on Wednesday he leaves for Georgia. As UNIAN reported earlier, during the visit it is planned that Joe Biden will meet with President of Ukraine Victor Yushchenko and Prime Minister of Ukraine Yulia Tymoshenko. It is expected that V. Yushchenko and J. Biden will honour a memory of victims of Holodomor (the Great Famine) in Ukraine in 1932-1933. It is also planned that J. Biden will deliver a speech before the representatives of business circles of the Ukraine.